I'm excited and green with envy. Because of their involvement in the production, friends of mine are off to Cannes. 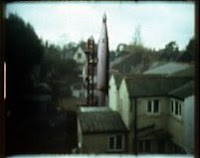 "The Last Trip" was shot, directed and produced by Dr Malcolm Finlay and is among 12 super8 films chosen to premier at the film festival. I say I am excited, they are more so because if it wasn't enough that they were going to the Cannes Film Festival for the first time, they haven't even seen the film yet! The straight8 prize has very strict rules, you have to shoot the film on one film cartridge (three minutes),so no editing, whats more you have to submit the film undeveloped. The first time the film makers will see the film is the screening and premier at Cannes. I'd love to be there to see their faces. Its a tremendous achievement the film beat off 163 entrants from all over the world to earn its premier at Cannes. I can't wait to see it. I'm surprised that there is not more about this in the press. I might give my friends a call and scoop an exclusive. In fact I'm sure I will, when they told me they were off to Cannes I reacted as if they had told me they were going to the shops or something. Its only today that full realisation has kicked in. My widgets for Blogger round up.